The Utah Polite Society: Front Sight offers $2k free training for AZ teachers. Front Sight offers $2k free training for AZ teachers. LAS VEGAS, Jan. 28 /PRNewswire-USNewswire/ -- Front Sight Firearms Training Institute founder and director, Dr. Ignatius Piazza is known by his hundreds of thousands of students as the "Millionaire Patriot" because over the last 11 years Dr. Piazza has provided tens of millions of dollars in training and benefits free of charge to assist law-abiding citizens in securing what he refers to as the "Comfort of Skill at Arms." In response to Arizona Senate Bill 1214, which would exempt concealed-carry permit holders from a state law that bars individuals from knowingly carrying deadly weapons onto school property, Dr. Ignatius Piazza has committed to provide every Arizona School teacher with a $2,000, Four Day Defensive Handgun Course, free of charge if Arizona lawmakers will pass the Senate Bill 1214. If it becomes law, the measure would allow teachers to carry their weapon onto the grounds of any public or private K-12 school, college or university in the state. Dr. Piazza wants to put the Arizona public and legislators' minds at ease in passing the measure by training all school teachers free of charge to levels that exceed law enforcement standards. Ignatius Piazza states, "Every time sanity begins to prevail with good legislators like Arizona Senate Majority Leader Thayer Verschoor and Senator Karen Johnson introducing a real solution to protect our children from a violent attack, the unenlightened begin crying about their fear of teachers with guns. The same people who don't want teachers with guns are happy to have more cops on campus at tax payers' expense. Front Sight Firearms Training Institute will train teachers who secure a Concealed Carry Permit to levels that exceed law enforcement standards, giving Arizona Public Schools immediate and trained armed response to violent attack and save Arizona tax payers millions of dollars." But Rep. David Lujan, a Phoenix Democrat and president of the Phoenix Union High School District board, said he is "uncomfortable with having weapons on school campuses." In the context of a school shooting, for example, he said the prospect of additional weapons in the hands of faculty or even students could "exacerbate the situation" when police arrive on scene and are trying to quickly identify the assailant. Piazza responds, "Representative Lujan simply needs to take Front Sight's Four Day Defensive Handgun Course and he would walk away knowing he has the proper decision making ability in the judicious use of deadly force and the handgun skills to stop a deadly attacker immediately, safely and responsibly. He would then have the same confidence in any of his Arizona teachers who completed Front Sight's course." Piazza adds, "When police arrive on the scene it will be very easy for them to identify the assailant. He will be the only dead body because an armed teacher stopped a potential massacre as soon as it started." 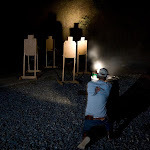 From the hundreds of testimonials from law enforcement officers who have attended Front Sight Firearms Training Institute near Las Vegas, claiming it is the best firearms training they have ever received, it appears Ignatius Piazza can deliver on his promise to train Arizona teachers to levels that exceed law enforcement standards. The fact that he will provide the firearms training free should make the Millionaire Patriot's offer very hard for teachers, schools districts or legislators to decline.